3 for 2 offer: add 3 of the same product with the same or different design and get the cheapest free. The discount will be applied automatically in the basket. Design your own photo tea towel, and brighten up the kitchen with your favourite memories. Printed edge to edge and sewn to order, personalised tea towel printing bring a modern twist on a truly classic gift. Create a drying up cloth with your own designs. Add mum's special Pavlova recipe using the text tool, or make the perfect teacher end of year present printed with a class photo. Full colour tea towel printing makes you the designer, and you can even choose to add a coloured wavy ric rac edge to you towel for extra pizzazz. We are fast, and print most products in one day if you order before 8:00pm. Excludes delivery time. Lovingly handmade by our talented artisans here in our studio. Create your own quintessential tea towel, made from natural cotton-linen fabric as an ideal 2nd anniversary gift. A blast into the past, this beautifully printed tea towel is like the school tea towels your kids bring home, but with full colour photo print quality and fantastic soft cotton-linen. Lightweight, but still a tea towel of considerable drying power. A 100% natural blend of cotton & linen and printed all over, this dish cloth is made from pesticide free natural yarn which has a lower environmental impact than paper towels and will last for years to come. Your custom printed cotton tea towel requires a little more tender love and care to ensure long-lasting colours. You can wash them in the machine at cold or delicates setting, or hand wash your cool cotton linen tea towel and they will retain their vibrancy. Got these personalised tea towels for my parents for Christmas. They are really lovely! Excellent print colour, quality and time to delivery. I would definitely recommend and use again! Great quality, images look fantastic. Very happy with my purchase. I also loved being able to track my parcel throughout its journey from the UK to Australia. Excellent service. The tea towel is excellent quality and the printing is of a high standard. The programme was easy to use and the communication after purchase could not have been better. The tea towel was delivered extremely quickly. Thank you. I received the product I designed exactly as it appeared online. Delivery was quick, though the inability to allow delivery without a signature was a bit inconvenient. Overall I am very excited to give this gift as the quality is very than I expected! Care: Machine wash cold (delicates setting), or better still hand wash. Dry flat. Follow the care instructions to ensure lasting colours for a long time. 2 year guarantee on sewing. Guarantee: *Sewing and textile guaranteed for 2 years. Cotton fades with washing so we cannot guarantee against fading. Tea towels are incredibly versatile. You can cover a meal, use as a place mat, take on picnics, have as a decoration on the shelf or inside cabinets, serve warm bread under, or use as a table runner. You can of course use them to dry fine china and glasses. Our cotton linen tea towels are excellent for drying wine glasses and leave no fibres unlike most standard tea towels. 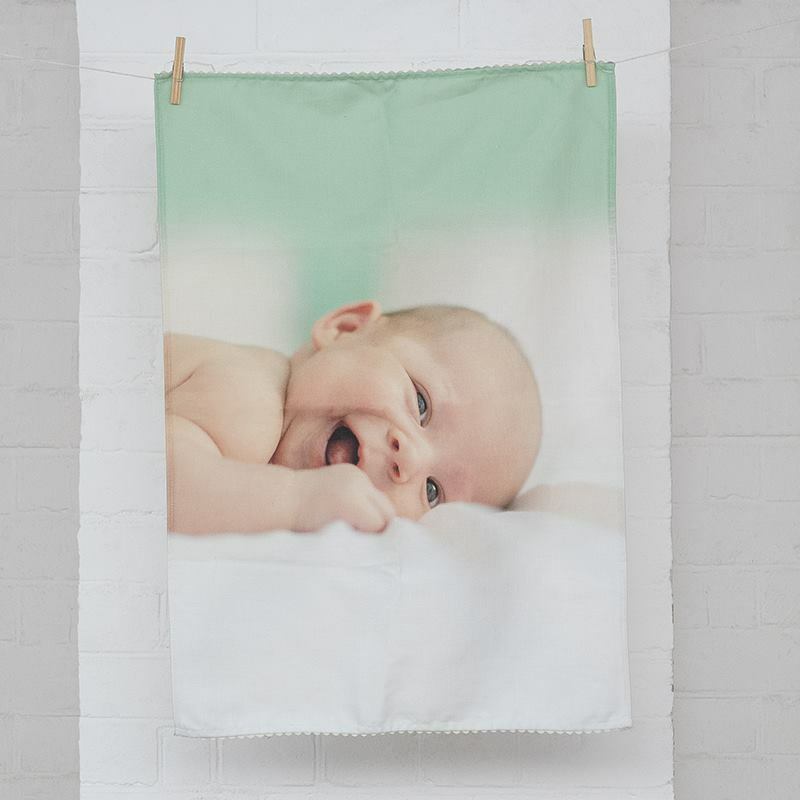 Using a high tech printing process, your photos and designs and printed directly onto the smooth, cotton-linen fabric. This technique uses heat and pressure to fuse eco-friendly inks deep into the fibres of the fabric, ensuring a permanent, consistent, and vibrant print. The printed tea towel fabric is them stitched and finished with your choice of hem. As your customised tea towel is completely handmade to order, you can be sure to receive a genuinely unique and lovingly made product. Please note: A small barcode will be printed on the reverse side of the tea towel, but this will not affect the quality of your tea towel. Tea towels are not just for drying up. For a modern kitchen art idea, you could design a personalised tea towel featuring your own artwork, or a stunning family portrait photo in place of tired old photo frames. Tea towel wall art is a unique way to spruce up the kitchen decor, and also makes an excellent decorative gift which will surprise and please any recipient. Short of gift ideas for someone? Why not make your own personalised cloth and present it as a special gift, perfect for a teacher's end of year present, and ideal for mums and dads who spend all their time in the kitchen. You can add a photo of all the kids so that they're reminded of how much they're appreciated every time they enter their kitchen. 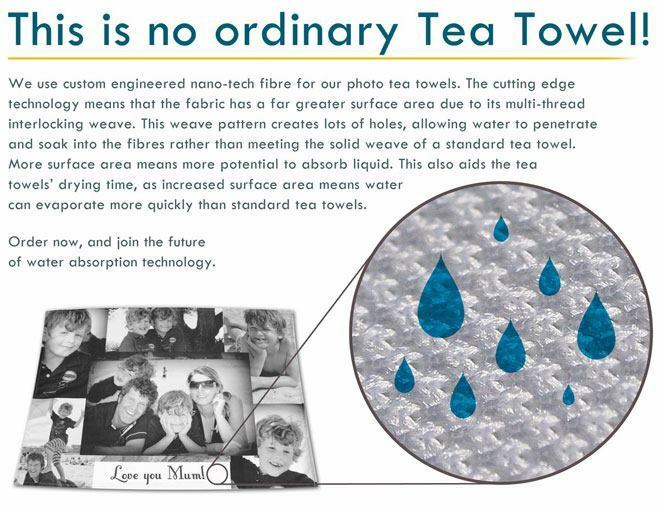 You could add mum's best recipe onto a custom printed tea towel - just make sure not to give away to secret ingredient! Design a tea towel to celebrate a wedding, and present it to the newly wedded couple as a unique gift that'll last for years as a special keepsake. Wedding tea towels can be customised with the date of the wedding day, and the names of the bride/groom and groom/bride. Add a photo of the two from when they first met or, as a memorable anniversary present, you could print a photo of the couple from the wedding day so they can reminisce. Create your own personalised BBQ apron with your photos or designs, perfect for Summer parties. Handmade to order.